Caring for environment: Judicial vicar Fr Adrian Farrelly explains what making environmental protection part of canon law would mean for Catholics. Photo: Emilie Ng. PLANS to make Catholics legally obligated not only “not to harm” the environment but to improve it has “real merit”, Brisbane canon lawyer Fr Adrian Farrelly said. 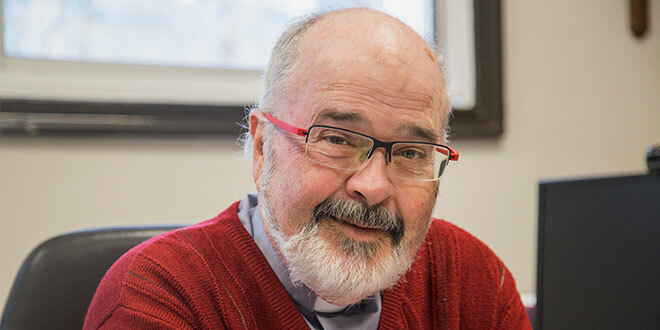 Fr Farrelly, a judicial vicar for the Queensland Regional Tribunal, said he agreed overall with a proposal from the former head of the Pontifical Council for Legislative Texts to insert a new canon in the Code of Canon Law obligating Catholics to a “grave duty” to protect and improve the environment. According to Vatican Insider journalist Andrea Tornielli, Cardinal Francesco Coccopalmerio said at a closed-door meeting in Rome on July 12 that he would propose to Pope Francis a new canon to be inserted in the section of canons 208 to 221 that outline the obligations and rights of the people of God. “I would think that Pope Francis would give it very, very serious consideration,” Fr Farrelly, pictured, said. The particular section of the code it would be inserted into also lists that Christ’s faithful must make an effort to live a holy life; that they are bound by an obligation to maintain communion with the Church; and are obliged to attend the Mass on Sundays and holy days of obligation. If it were to be inserted in the code of Canon Law it would mean the Church would raise care of the environment to a level of obligation, not just an option. Though inspired by Pope Francis’ 2015 encyclical, Laudato Si: On care for our common home, Fr Farrelly said the last four popes, St Pope John Paul XXIII, St John Paul II and Pope Benedict XVI, and Pope Francis, advocated for greater responsibility for the environment. “We don’t want to mess in our own nest, if we could use that sort of phrase that we have,” Fr Farrelly said. Failing to do so would be acting like irresponsible tenants who “have trashed homes and units without any regard for themselves or for the one who owns the place or any future tenant”. “That is what we’re doing to our common home which is our planet,” Fr Farrelly said. Fr Farrelly said efforts by Australia’s two largest supermarkets and the Queensland government to ban plastic bags, and a recent promise by food chain McDonalds to phase out plastic straws showed Australians “realise our actions have responsibilities”. But while an obligation to care for the environment in the Code of Canon Law could never be enforced on the faithful, “neglecting our obligations weakens the communion of the Church”. “We’re obliged to support each other in the living of our faith, we’re obliged to celebrate the Eucharist on Sundays and holy days of obligation,” Fr Farrelly said. “Do they get enforced? Do you get a fine if you don’t? No, but neglecting our obligations weakens the communion of the Church.